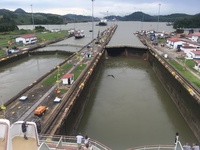 Panama Canal Westbound Transit Sep 24-Oct 9, 2018. This was our sixth and longest cruise. We’ve cruised Princess, MSC, Carnival and The Red Boat. This was our first cruise on Celebrity Infinity and probably our last. We cruised with three other couples and chose Celebrity primarily based on the transit of the Panama Canal destination and sailing date. None of us sailed Celebrity before. We also used an agent who books with Celebrity and booked the cruise almost a year in advance. Two couples had ocean view cabins, one the 2nd deck and the other on the 8th deck. Two of us had veranda cabins, 2A both on the 7th deck. I might add I’ve read other reviews for this cruise line and ship, so I will try not to repeat a lot here found in those reviews. We found the cabins to be comfortable and accommodating. Space and furniture were comparable to the other cruises we sailed. The TV programming was good and offered a lot of variety programming. Cabin service was excellent mainly because of the hardworking attendant who performed well beyond our expectations and experience on previous cruises. We left an additional tip and identified his efforts to cruise management. We found the restaurants and food to be good to excellent but mostly excellent as most cruisers expect. We ate in open seating in the main dinning room for most evening meals and were seated at several different table locations. Service varied between the different locations but was generally good but slow between courses. The longest time between courses was15 minutes. Generally we enjoyed the menus, but Celebrity did not perform above other cruise line meals we’ve had. We also ate a few times in the specialty restaurants- three times at Tuscan Grill and once at Le Petit Chef. Food was good and service excellent. Le Petit Chef animation was unique and entertaining. None of the specialty restaurants were anywhere near full when we attended. We booked prior to the cruise and should have waited until we were onboard to take advantage of the last-minute discounts. The buffet was a buffet. Plenty of variety and some unique specials if you were lucky to find them. As is common on most cruise ships, the buffet was crowded especially at breakfast and lunch. The buffet was named Ocean View and lived up to its name, with plenty of window seating and a nice outdoor seating area on the stern. Other snack areas were adequate but nothing special. The gelato place was costly, but good. The table service at the bars was almost nonexistent and very slow when available. We like cruises for the destinations, food, entertainment, onboard activities and excursions. For us the Celebrity Infinity scored no better than other cruise lines in the food and excursions categories, and below standard in the in the entertainment and onboard activities categories. The Panama Canal transit was exceptional though and I would rate it as good, if not better, than visiting Glacier Bay in Alaska. Bill Fall’s lectures and personal stories with the canal were outstanding and made the cruise very worthwhile. One deficiency was his narration could hardly be heard on the ship’s outside speaker system and while transiting the canal most people were outdoors. We used Celebrity excursions at every port and found them to be varied, interesting and worth the cost. On ship activities were lacking especially towards the end of the cruise when everything was familiar. We also found shopping to be mostly high-end tax-free type merchandise. Not a lot of variety for lower scale items on a regular basis. Our biggest disappointment was with the entertainment. The major problem was with the amplification system in the beautiful theater. It was much too loud, more suited to an arena rock show. The house band was good, but they were over amplified so much you couldn’t hear or understand performer’s voices. There were some exceptions to this, but they were very few. One of the members of our party would get headaches lasting several hours after these shows. I wore earplugs for all the musical performances, except for the first. I felt sorry for the ship’s in-house company who performed admirably for the three major in-house shows. The dancing was excellent and obviously required much talent and energy. There were no ship’s officers present (that we saw) during any of the performances except for the next to last night. I mentioned the sound situation to him and the sound seemed better, but still loud, for the last performance. (I might add I have10 years’ experience as the technical manager for a college performing arts center.) The entertainment lacked variety with a heavy focus on vocalists and rock music. There were two excellent comedians. I don’t usually like comedians much primarily because I don’t find adult or political humor entertaining, but the two comedians during this cruise were outstanding and avoided both topics. We found the cabins to be comfortable and accommodating. Space and furniture were comparable to the other cruises we sailed. The TV programming was good and offered a lot of variety programming. Cabin service was excellent mainly because of the hardworking attendant who performed well beyond our expectations and experience on previous cruises. We left an additional tip and identified his efforts to cruise management. Nice trip. Good views of the &apos;point&apos; and city area. Beautiful City. Carriage ride was very nice. Nice excursion however description misleading and inaccurate on web site. Crew presented &apos;air&apos; rock show on board which was very loud.